Interesting that Ã¢â‚¬Å“stubbornly lowÃ¢â‚¬Â U prices were said to be largely responsible for the PDN decision to shutdown it's Namibia mine, yet Cameco reported yesterday they have swung back into the black, partly on the back of improved prices. CanadaÃ¢â‚¬â„¢s Cameco (TSX:CCO) (NYSE:CCJ), the world's largest publicly traded uranium producer, swung back into the black in the first three months of the year thanks to improved prices for the commodity and the companyÃ¢â‚¬â„¢s efforts to lower costs. Well, that didn't last long - Paladin Mark II. A few months after recapitalisation/relisting PDN has flagged the closure of its Langer Heinrich mine in Namibia in response to Ã¢â‚¬Å“stubbornly lowÃ¢â‚¬Â uranium prices. U prices have been "stubbornly low" for a great number of years - makes one wonder what the point of rebirthing PDN really was. Deutsche Bank seems to have ceased being a substantial holder - lucky for them, . Where to from here - will there be a PDN Mark III? Any investors who held before the VA might at least now get a small % of their investment back - if they are smart. The sp gain is based on the pre-suspension trades. Considering the holders lost 98% of the NUMBER of shares, even with the sp increase, they're down more than 90% by VALUE of their holdings. Glad I had sold all of mine in 2007 and didn't return since. Back from the dead. 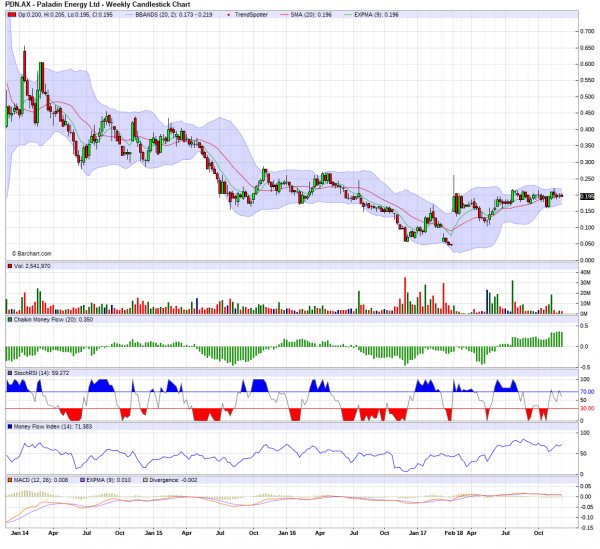 Can't believe it's up 330.85% - DB pumping it? Hope it doesn't go the way of PDN MarkI. Long-suffering shareholders of Paladin Energy who lost 98 per cent of their investment when it collapsed last year will take some heart from seeing the stock soar on its re-listing today. 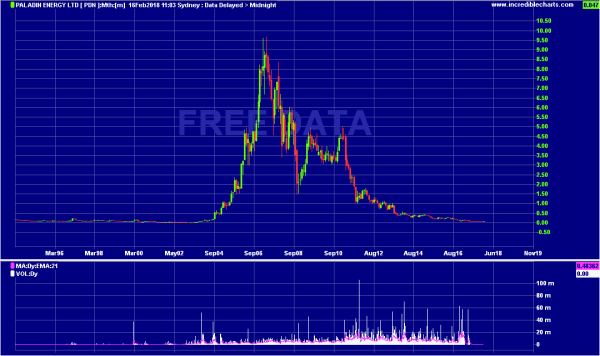 Shares in the recapitalised uranium miner opened at 15Ã‚Â¢ when it rejoined the boards of the Australian Securities Exchange this morning after an eight-month suspension, more than three times higher than the 4.7Ã‚Â¢ at which it last changed hands. The stock traded in a wide range between 15Ã‚Â¢ and 26Ã‚Â¢ this morning with investors struggling to come to grips with what might be considered fair value for the restructured company. At 9.40am, the stock was trading at 22Ã‚Â¢ for a market capitalisation of about $374 million. 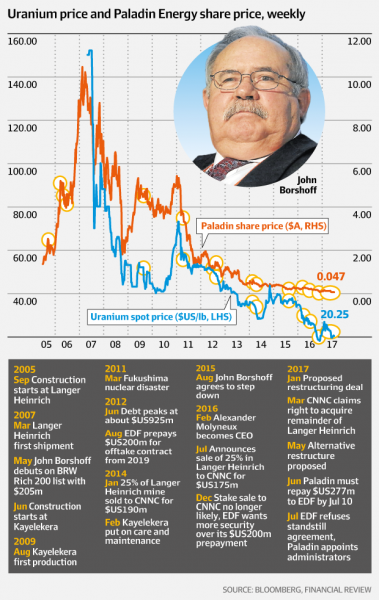 Paladin was recapitalised under a deed of company arrangement, which gave control of the uranium miner to its bondholders and creditors under a debt-for-equity swap. Under the restructure, Paladin struck a new $US115 million bond issue and will begin its new life with about $US70 million in cash as well as all its previous assets. Deutsche Bank has emerged as PaladinÃ¢â‚¬â„¢s biggest shareholder with a 16 per cent stake after buying debt in the former entity from French creditor EDF. Rick Crabb will remain chairman, joined by new directors Daniel Harris, John Hodder and David Riekie. Alex Molyneux will resign within three months. Mr Crabb said the companyÃ¢â‚¬â„¢s future rested with the low uranium price, noting the bondholdersÃ¢â‚¬â„¢ decision to take equity in the company reflected their bullishness around the future price. Mr Molyneux said some were predicting a Ã¢â‚¬Å“pinch pointÃ¢â‚¬Â for the uranium market in 2019/2020, considering it to be Ã¢â‚¬Å“the last shoe to dropÃ¢â‚¬Â in the commodities market. The end result will be bondholders and Deutsche Bank, which acquired Ãƒâ€°lectricitÃƒÂ© de France S.A's claim, taking a 98 per cent stake, which includes a 70 per cent share for existing bondholders, another 25 per cent for buying the company's new bonds and 3 per cent for parties underwriting the new bonds. Deutsche Bank will be Paladin's biggest shareholder with a 40.7 per cent stake, while other substantial investors include Value Partners Hong Kong (10.7 per cent), JPMorgan (9.1 per cent), BlueBay Funds (6.9 per cent) and Leader Investment Corporation (5.6 per cent). Paladin's existing equity holders, including HOPU Clean Energy, will retain the final 2 per cent. i were screaming that time---to short it ---from 8 bucks all the way to little over 10 bucks. the price is too good to be true then. so sad that i didn't hold that shorts , it was a big position for me at that time!! attached Schedule (together, the Relevant Companies). to each of the Relevant Companies. France S.A. (EdF), the boards of the Relevant Companies met and resolved to appoint Administrators. restructure and recapitalisation of the Company. Companies and intend to continue to operate the company on a business as usual basis until further notice.